>> Review track listing and hear some samples. To purchase the CD (£13 including postage and packing) on line click the "Buy Now" button once and then you will be directed to a site where you can confirm your order and complete the payment process. You do not need to sign up to a PayPal account to order, you can simply pay by credit/debit card. You can also pay by cheque or postal order (see below). For UK orders I will send the CD by Royal Mail as soon as I can. For overseas orders I will ship by Parcel Mail. CDs are £12 each plus a single charge of £1 for postage and packing independent of the number of CDs ordered. E.g. ; If you want one CD, the cost is £12 + £1 = £13. If you want 3 CDs, the cost is £12x3 + £1 = £37. 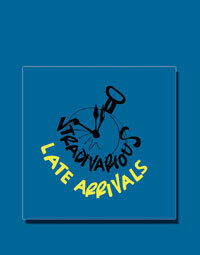 Please indicate that you want the CD Late Arrivals and provide your name, address and a telephone number (just in case we have any questions). If you let me have an email address, I will email you as soon as the package is shipped. Please contact Rod to book Stradivarious.